You are here: Home / Arts / Hubris in Athens, a new play by John Green, November 28/29 in Victoria BC. 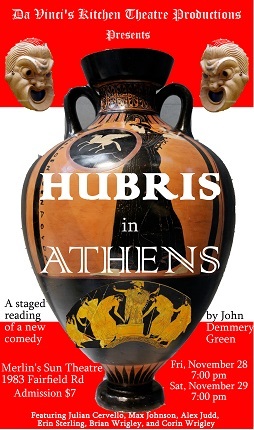 Hubris in Athens, a new play by John Green, November 29 in Victoria BC. Media Release. Electoral reform: a snore-making topic to be avoided in polite society, a cause worthy of passionate debate, or something to laugh about? Victoria playwright John Demmery Green suspects that most people would pick answer one, but for him the battle to achieve proportional representation is both a passion and something people should have fun with. Green’s new play, Hubris in Athens, sets out to entertain and enlighten audiences as it explores both the problems that plague Canadian democracy and their roots in the mother of all democracies, Athens. Staged readings of the play on November 28 and 29 will raise funds for Fair Vote Canada, a multi-partisan campaign that advocates for change to our “first past the post” electoral system. Cervello is joined by fellow VSS actor Alex Judd, who will read the role of Menon, an out-of-control juror who creates endless trouble for the magistrate (read by Max Johnson, associate producer for Theatre Skam). Other readers include Screen Actors Studio alum Erin Sterling, local filmmaker, actor and director Brian Wrigley, and Corin Wrigley, whose recent credits include Lord Ross in Shakespeare By the Sea’s production of Macbeth and Lady Alicia in the Victoria Fringe hit Lady Audley’s Secret. John Demmery Green is a graduate of University of Victoria’s theatre and writing programs and a member of the Playwrights Guild of Canada. He is the founder of Da Vinci’s Kitchen Dramatick Theatre Productions Companie, which produced recent Victoria Fringe Festival offerings The Occupied Mind of Mr. K and Awkward Hangouts of History.